Donut (born Dorothy) lives in a small village in the early part of the twentieth century. Her mother died when she was born, and her father was recently killed in a car accident. Her Aunt Agnes from Boston has come to stay, but wants to take her back to the city because both she and Donut's Aunt Jo work in a girls' school, and they want Donut to benefit from a good education. Donut doesn't want to leave Sam, a neighbor who has taught her taxidermy, or her friend Tiny. Even though Sam agrees to let her stay, her aunts still want her to come with them, so Donut decides to run away. She's fairly well prepared, and sets up shop in a cabin belonging to a man who played cards with her father. Tiny and Sam know where she is, but she spends several days on her own. 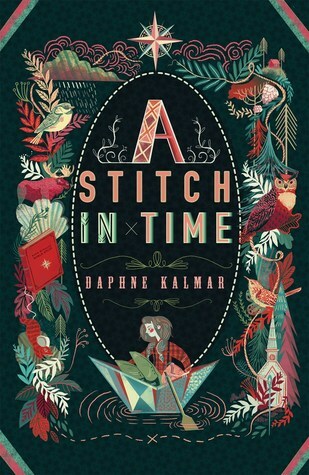 She investigates the boat her father left behind, befriends some animals, and realizes that she doesn't love her new Atlas as much without the encyclopedia to use to look up the places in it. When an accident ruins her lodgings and injures her, Donut must come home and formulate a plan for going forward. Strengths: This was sort of a backwards Understood Betsy, which I loved. Orphans having to live with random relatives were something I adored when I was young, especially in historical settings. It must have been a trend, because there were a lot of books like that. Donut's interest in taxidermy is interesting, and the tiny bits of women's rights well done and appropriate to the time period. Aunt Agnes was very understanding and kind, although it was understandable that Donut was angry about leaving her home. The adventure was good, and the supportive community heart warming. All in all, this read like an early twentieth century novel without having wildly creepy undertones like Rebecca of Sunny Brook Farm or Daddy Long-Legs do. Weaknesses: Historical orphans are not quite as popular as they were 100 years ago, and the taxidermy descriptions that start the book were a tiny bit stomach churning. What I really think: Debating. I'd love to be able to hand this to children, but I just don't have a lot of readers who are interested in this sort of book. I do have one or two this year; if I have more next year, I will certainly consider purchasing.